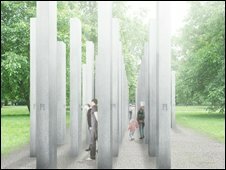 A £1m memorial for victims of the 7 July London bombings is to be erected in Hyde Park. Westminster Council has approved the memorial made up of 52 stainless steel pillars, one for each victim, grouped in four clusters to mark the attacks. It will stand on the east side of the central London park between Lovers Walk and Park Lane. The sculpture will be in place by 7 July 2009, and visitors will be able to walk around the three-metre columns. The casting process will ensure that each pillar is slightly different. Antony Gormley, creator of the Angel of the North sculpture in Gateshead, acted as an independent adviser for the memorial, designed by architects Carmody Groarke. Councillor Michael Brahams, chairman of the Westminster's planning applications sub-committee, said the memorial would be a "fitting tribute". "This is a bold and emotive sculpture which will ensure July 7 is never forgotten, and the cruel and needless loss of life, as demonstrated by each of the columns, is etched in the consciousness of future generations."